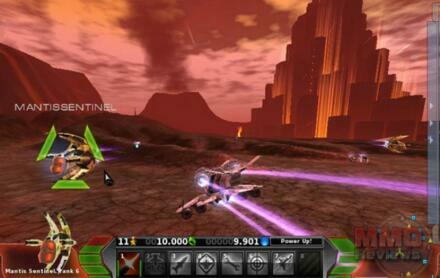 The main gameplay action happens on the planets' surfaces. This is where combat occurs, missions are completed and energy as well as Cryonite can be collected. Players can familiarize with the game by starting their mission on the surface of Vega 2. The game offer an interplanetary conquest mode, where player controlled fleets compete for the control of a planet and everything that comes with it. The fleets work as the guilds of other games. When a planet is available for conquest mode, competing fleets may conquer the planet by capturing and holding a number of strategic locations on the planet. The fleet that holds these points the longest has conquered the planet. A conquered planet brings the victorious fleet a bonus equivalent to the Mantis Cyronite in that star system and a smaller amount in surrounding systems. Pirate Galaxy can either be played in the game client or even directly via your web browser, without the need to install any game client. You control your spaceship with keyboard and mouse, and this combination makes space travel a piece of cake. Pirate Galaxy it's not just getting from point A to B, and you can fight by firing ion cannons, running Cryonite accumulators, using speed boosters, protecting yourself with shields and much, much more.